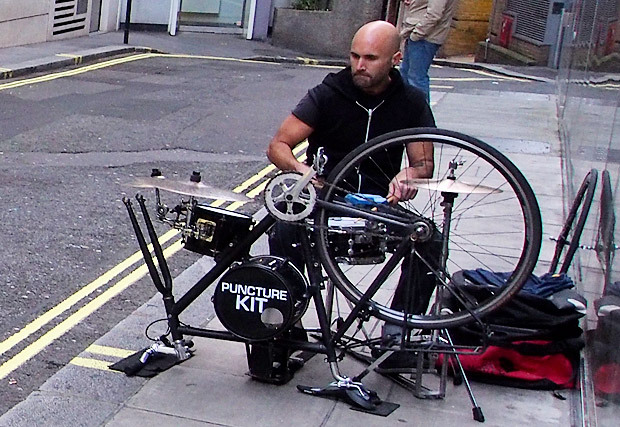 There’s a lot to be said for using a modern small drum kit: they’re less hassle to move about, lighter to carry and can be put up and taken down much quicker than a traditional kit, granting drummers more drinking time. Best of all, if your kit is small enough, you can even carry it on public transport and save yourself a fortune in cab fares. Of course, all this convenience introduces its own set of compromises, with smaller kits usually producing less ‘oomph’ – particularly in the bass drum department – and perhaps those pint-sized tubs won’t quite cut the manly dash hoped for if you’re a death metal band. 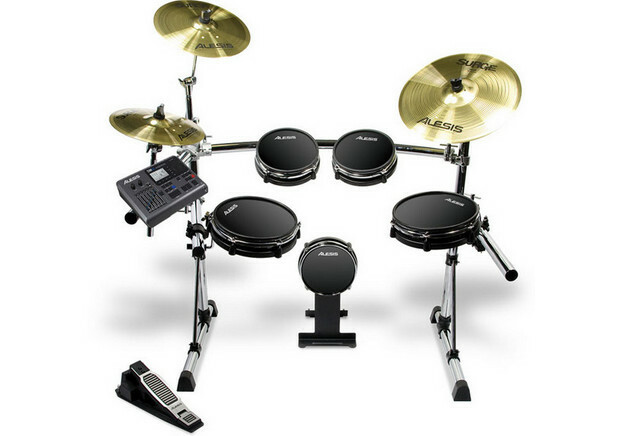 Another option is to go for an electronic kit – get a decent set and they can sound truly incredible, and advances in technology have made the pads feel much more lifelike and responsive. Trouble is that whatever savings you make in the overall kit size has to be offset by the amp you’re going to need to lug around with you – and by using an amp, fellow musicians less appreciative of your paradiddle action will always be asking you to turn down. For me, I hate the way electronic kits look and I don’t like hitting them either. Call me a old-school traditionalist if you like, but in my book, there’s nothing to beat the time-honoured sound of stick on skin! 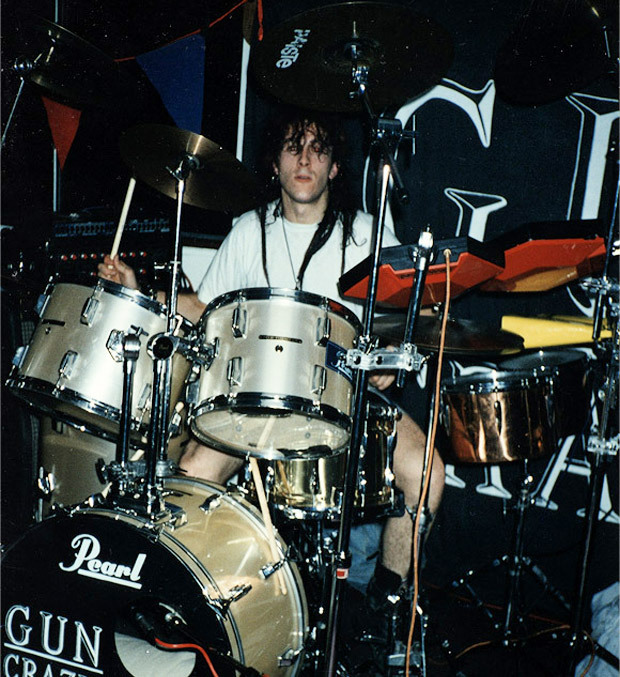 Back in the day when I had a record deal and hopes of stardom, I used to straddle the stage with a beast of a kit, packing enough drums and percussive whatnots to power a samba festival or two. With a hefty 26″ bass drum providing the foundation, this monster kit had an east wing full of Simmons drum pads, Premier brass timbales and tuned cowbells, while the west wing hosted a slew of cymbals and toms. I didn’t go as far as getting a gong, but had anyone offered at the time, hell, I would have been in. Time moved on, and I grew fed up with the machinations of the music biz and the never-ending disappointments, so I jacked it all in and took the classic musician’s exit route into art school (well, it’s got to be better than a job). 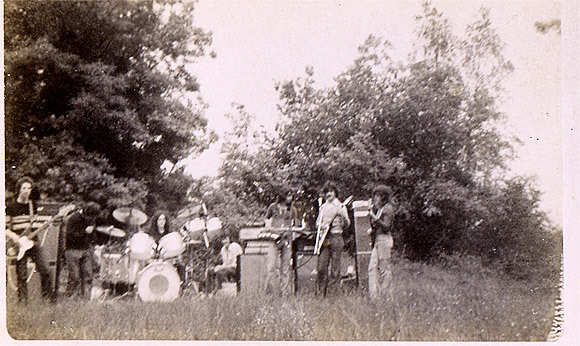 Although I’d been utterly disheartened by the music business (the last two bands had major deals but couldn’t release any songs because of record company politics), my love of music never went away, neither did my desire to tap out rhythms on any objects to hand (cutlery, pens, biscuit tins etc). I finally cracked a few years back and splashed out for a rather modest kit in the shape of a Pearl Rhythm Traveller, a budget number designed to double up as a home practice kit. 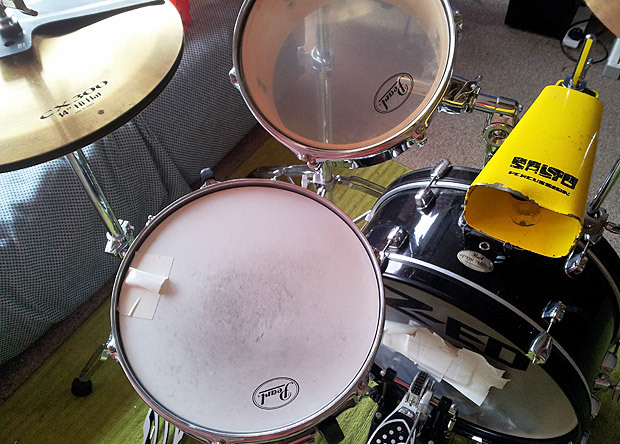 To keep the neighbour-bothering clatter away, the kit comes with ‘silent mesh heads’, which manage to reduce the thump of a beat down to a mere tap. 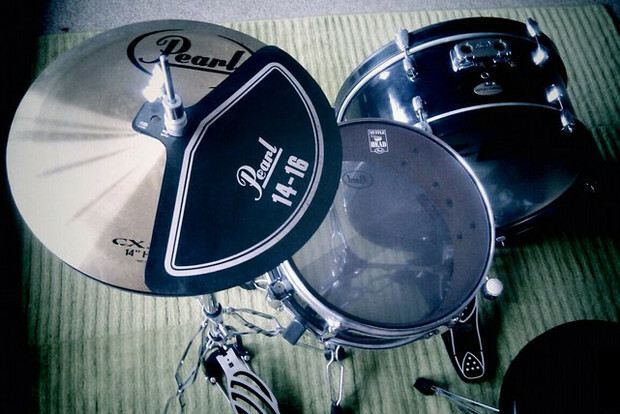 Combined with the rubber hi-hat and cymbal covers, they really are rather effective and dampening down a kit and make practising at home a real possibility. 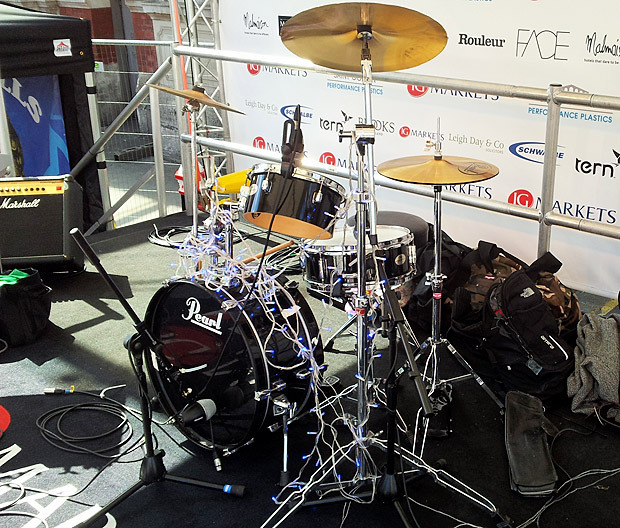 When you want to do a live gig, you need to swap over the heads for regular drum skins to bring back the volume – a job which can become a bit tedious if you start gigging regularly. 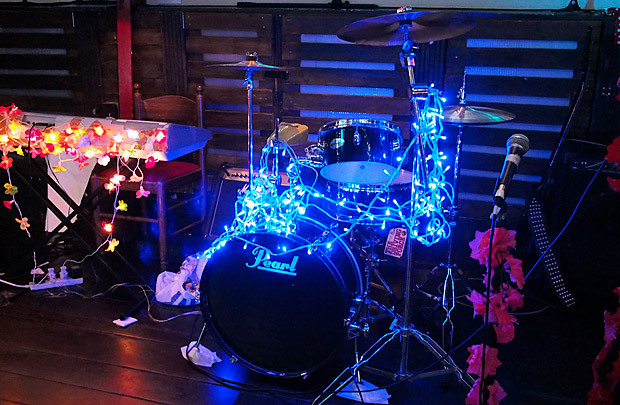 But once it’s all done – and you’ve taken a bit of time to get the tuning right – you’ve got a kit that is easily good enough for playing live in small venues, and fine for bigger ones too so long as there’s enough mics to pick up the sound. The kit comes with pretty solid hardware, a decent enough 13″ wooden snare, plus three floating, single head toms. The snare is pretty responsive, and although those narrow toms aren’t ever likely to reach John Bonham volume levels, once it’s all mic’d up, the kit sounds a lot bigger than you might expect. 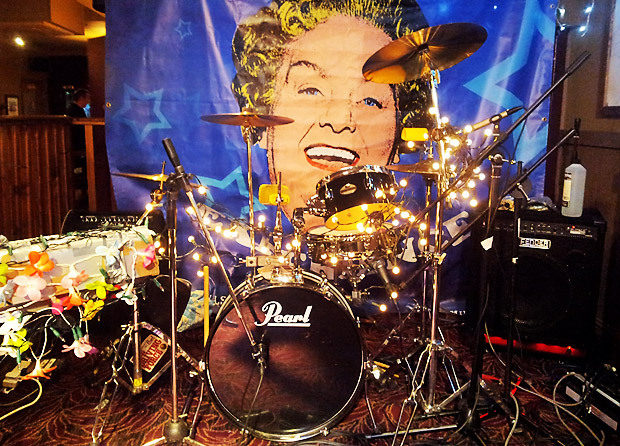 Since forming a new band – music hall sensation, The Mrs Mills Experience – I started using the kit for live work. Given the old-time nature of the music, I started using a super stripped down set-up consisting of the just the snare, the narrow 20″ x 8″ bass drum and one, teensy-weensy 10″ x 5″ floating tom. The cymbal set up was kept equally minimalistic, employing the rather average 13″ Pearl hi-hats and a 16″ Pearl cymbal that came bundled with the Pearl Traveller kit. The 16″ cymbal bills itself as a crash/ride but they’re ‘aving a bit of a laugh there, as it’s only good as a crash. With the band moving on to bigger things and with a BBC TV appearance booked, I decided to invest a bit more dosh into the kit, as well as adding a few antique percussive parts from my original (ahem) ‘pop star’ kit. I dug up my well battered Paiste 505 Splash (which still sounds great) and an equally battered and seriously dented Salto cowbell, which, despite its damage, can still make a satisfying ‘donk’. I’ve always tended to thwack the feck out of my kits, so I upgraded a few of the stands to something a bit beefier, and a recent visit to the excellent DrumShack in Battersea saw me investing in a new snare and hi hats. The 13″ Mapex MPX steel snare was an incredible bargain for around £16o and sounds great. It’s got a fabulously crisp sound, and is really well-built for the price. I recommend you definitely put it on your short list if you’re looking for a small, loud, great sounding snare. The horrible Pearl hi hats that came with the Traveller kit had to go, so after trying out a host of combinations at DrumShack, I eventually settled for a 13″ Zildjian A Custom Projector top hat with a 1980s vintage Paiste 2002 Sound Edge bottom. It sounds fabulous! I still need to get a decent ride cymbal and after trying out a load of them at the Drum Shack have realised that to get anything with a decent tone, I’m going to have to spend well over a £100. Time to start saving! If the band continues to take off, I may look at investing in a compact, gig-only kit, and then keep the Pearl kit as a practise kit. 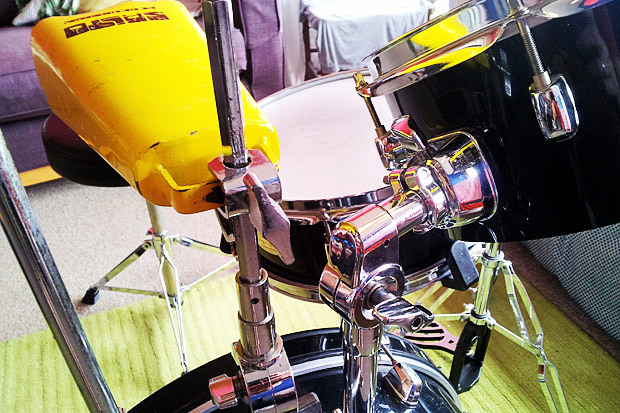 These apparently now come under groovy names like ‘Hipgig’, ‘Cocktail’, ‘Junior’ and ‘Jungle’ drum sets, with some featuring tiny 14″/16″ bass drums with bass drum pedals being affixed by rather curious adapters. 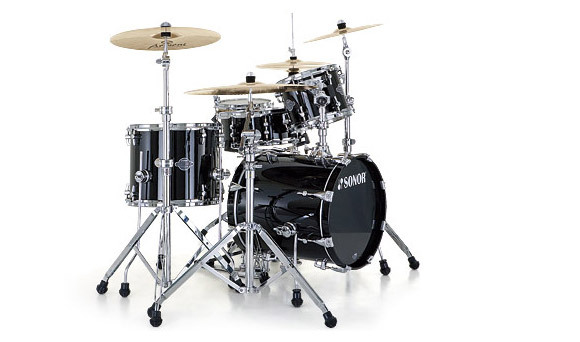 Some of these small kits look absolutely lovely – the stunning Sonor Jungle Set in piano black above is causing all sorts of convulsions in my wallet, although it’s not cheap at around £600. The Sonor is made up of a 16″ x 16″ BD, 10″ x 8″ and 14″ x 12″ toms – but you’ll still need to shell out for the stands, snare and cymbals, so you’ll be looking at the best part of a grand for this beaut. 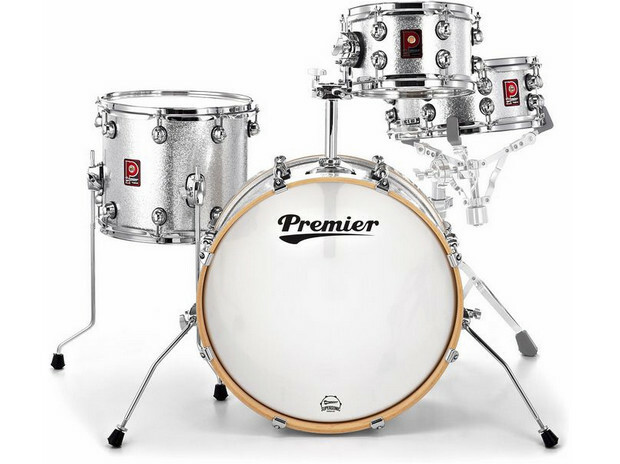 Another example is this fabulously retro Premier Artist Heritage Club kit, which is resplendent in its 1950s silver sparkle finish. Supplied with 20″ x 8″ BD, 13″ x 5.5″ snare, 13″ x 11″ and 10″ x 6″ toms this kit looks fantastic. It seems quite hard to find online, but at the time of writing Thomann has got the kit on offer for £540. Taking compactness to levels far beyond where I want to go is the Peace Manhattan Cocktail Drum Set (above left). This bizarre looking concoction serves up a ‘vertically accessible’ 14″ x 18″ kick drum, played via a reverse-cam bass drum pedal, with a 14″ x 5.5″ snare drum on the top and a floated 10″ x 5″ tom. 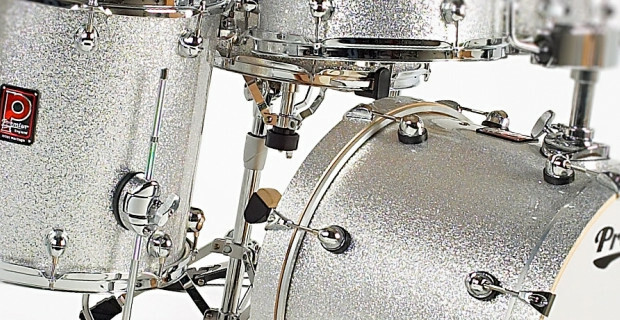 Various cymbals are positioned via a three independent mounting arms, making for a tiny kit capable of playing full beats. Aimed at the rock’n’roll set, there’s a lot to recommend this kit, but I have to say that I’d feel a bit of a chump standing up playing! However, if you’re loving the look of these vertical tub-thumping creations, there’s a handy guide here which shows the various kits available. Post up about your own set up! I’d love you to share the details of your own kits and your experiences of building and playing ultra compact kits. Please use the comments box below! Update July 2013: I bought a new kit! Read the full story – and review here. Cheers man. Im just starting out and found this very informative. Very informative indeed, can’t help liking them all. Well almost, cheer’s, good article. Very nice article. I gig with a PDP Chameleon kit with proper bottom reso. heads in place of the supplied mesh ones. I keep shouldering taunts and chuckles from the rest of the peanut gallery on stage. They don’t complain about the sound though, they sound fantastic. It’s great to see that there are other drummers with common sense when it comes to lugging the smallest gear possible around the country. Far gone are the days of the 10 pc kit thank goodness. My back thanks me at every gig. Here’s a link to an article on the kit. Your new Gretch kit is a thing of beauty by the way. Cheers for the feedback, Tom. That PDP Chameleon kit looks good too. 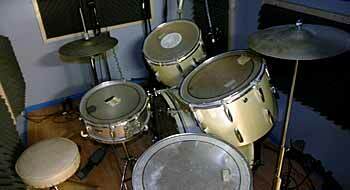 Side Kick Drums has a small portable drum kit called the Skinny Drum Set. All 6″ deep shells in full size diameter sizes so you still get a nice full sound. The toms are cymbals stand mounted for a compact foot print on stage. Cool little article, I’m returning from a long break from drumming and looking for a small kit I can squeeze into a space in the house. 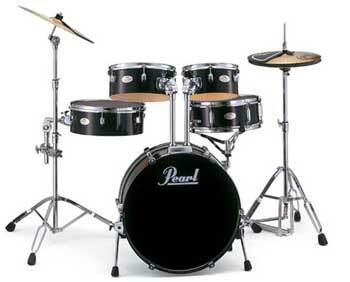 I was looking at the Sonor/Pearl/Yamaha club kits but I’ve got no stands or cymbals at the moment so would cost too much. I discovered the Odery Cafe Kit this morning, and I think it ticks a lot of boxes. My only worry is that it would be too quiet for gigging with a big band. I used to use 20,14, 12 back in the day and that was fine, these are 14, 10, 12. 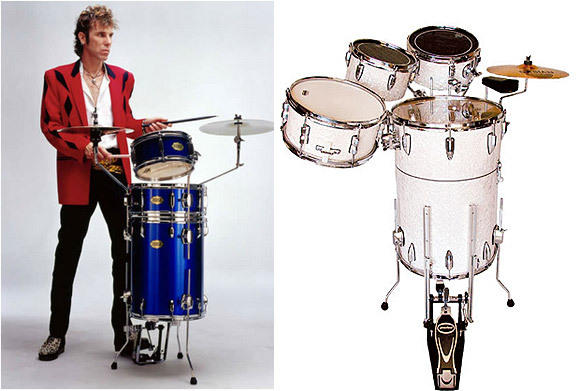 I looked up that kit. I think you’ll be OK for volume.